But that was about something else entirely. 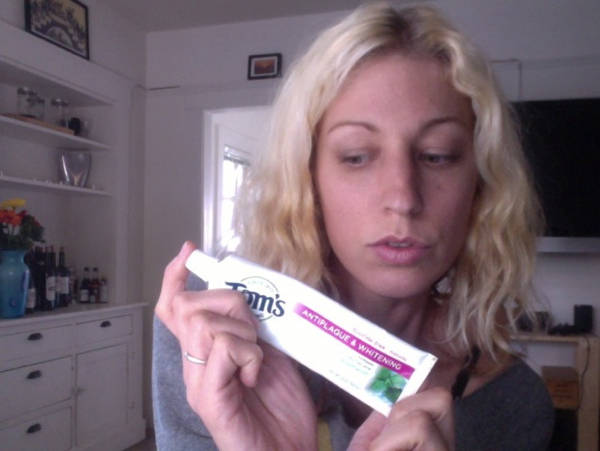 Tonight I’m talking about Tom’s toothpaste. With all of you. Which is sort of unexpected. To be fair, at first I was just talking to Jeremy, while getting ready for this gallery opening that we’re now sort of late to. But he was like “Um, why don’t you just ask your readers?” and I was like, ” . . . Well . . . Yeah!” So I snapped that pic up there, and scribbled down this little post, and here we are. So this is the thing. Tom’s toothpaste has offered me a not-insignificant amount of money to partner with them for the next year. This would mean writing for their blog, hosting a twitter chat, stuff like that. And I am conflicted as to whether or not I should do it. 1. I like that Tom’s is cruelty-free, widely-available, and easily accessible to people from all walks of life and in all sorts of situations. I like that this brand is big enough to have “reach”, and thus a healthier option is available to many more people. 2. I use Tom’s. Truth! Jeremy uses it exclusively, and I use it along with my homemade stuff, as well as a few other products. But I do use it, because it is inexpensive and available at Trader Joe’s, and I’d be lying if I said I didn’t. 1. This brand is owned by the parent company Colgate. Which obviously, is a giant corporation and NOT a natural company. So . . . do I say no to the good part of the bad company, because of the bad part? OR, do I say yes to the good part of the bad company, to help them see the importance of the good part? 2. That’s pretty much it. Number 1 is really the issue I’m having here. So, what do you guys think? Of course, it’s entirely possible that by writing this very post, I will ruin any chance that I had of this actually happening at all. Which is sort of the story of my life, haha. But anyway, it’ll be interesting to hear all y’alls thoughts, and good for me to think about for next time. So please, weigh in! How would you feel if I partnered with Tom’s? How do you feel about this brand? Thank you all SO MUCH for such wonderful, thoughtful input! I’m touched by how many of you took the time to share your thoughts, and you’ve given me lots to think about. Thank you for being involved, thank you for the support, and thank you for being such an incredible community. You guys are amazing – THANK YOU! i have absolutely no respect for tom’s since they sold out to colgate (seriously? adding sls *back* into their toothpastes? what? ), just like i have no love for burt’s bees (since he long ago ceased to have anything to do with his own company); his gold-digging money-grubbing ex sold out to clorox. please sayward, dear, stay true and poor, but have integrity, which is priceless. (and please let them know why you won’t sell out!). keep your reputation unsullied! there are many more amazing companies out there worthy of your support and endorsement. even if your financial worth may not grow, you will become rich in other ways. :) <3 you! 3 words.. Sodium lauryl sulfate. Avoid. Toms tries to sugar coat the truth about it in their product, but why wouldn’t they, they’re owned by the same people feeding the masses flouride ‘ for healthy teeth’. This situation can be analogous to eating at non-vegan restaurants. If your coworkers have a lunch at a steakhouse, do you refuse because it’s a steakhouse, or do you go, eat the limp salad, and try to change the restaurant from the “inside” by proving that there is demand for vegan items on the menu? When you buy Toms, you are buying Colgate. You are voting with your dollars that Toms is a worthy, in-demand product, and you value those principles. But at the end of the day, the money goes to Colgate. So, for the same reasons that you refuse the job, do you also refuse to buy Toms, or shop at any place that isn’t socially, environmentally, and ethically responsible? (Colgate does have a Sustainability Report, like an annual report, so at least *somebody* is thinking about it). I strive to change the world one person at a time – subtly, and through example. I will work at a large company in the “good” part (once I *was* the good part), and work diligently to change corporate policy as a whole. (I have refused jobs in the past from companies with no “good” part, or companies which did not even pretend to address issues that are my core values). This approach has always been successful, and although there are rare times where I have to defend my employer, when I mention the changes I have brought about it’s well received and appreciated. The world as a whole is not ready for the social, environmental, and ethical policies that we (or I) see so clearly as a requirement for a sustainable future. I try to change the world and conceptions one person at a time, and working on the “inside” gives you more power to do so. A dollar is just a statistic. An employee is a voice. They have contacted you, so they are interested in your voice, your opinions, your drive for change. That alone is huge. Finally, what does your gut say? If you do take the job and end up not liking it, you can quit, knowing that you tried your best but they would not change. If you refuse the job on principle, will you regret refusing the opportunity to change the minds of people for the better? opposing question is also worth asking. But they may help your gut! I agree with Stefanie – it’s not a crime to put food on the table. Also, when you are stuck with a decision like this, you can turn to the principle of double effect (http://en.wikipedia.org/wiki/Principle_of_double_effect). This is an ethical principle for making a decision when what you want to do has a negative side effect that you would otherwise not choose to do. In this case, you want to promote Tom’s, which is a product you already like, in order to increase your income, which is a positive outcome. The unfortunate side effect is that way, way, way over there in the corner stands Colgate, and you would rather not promote them. The only perfect vegan is a dead one. You could take this opportunity to demonstrate to other vegans, or other people thinking of begin vegan, that we live in the real world too. We’re not breathing some rarefied air where everything is sunshine and roses and no creature will ever suffer because of our saintly existence. I ran over a small creature the other day while driving because surrounding traffic made it impossible for to swerve out of the way without striking a person or vehicle. That is the price you pay for driving. But I still choose to do it anyway, and I still call myself a vegan. Sayward, don’t be so hard on yourself. I say, 99.5% vegan is good enough. We have to let the other 0.5% slide, or we’ll all go nuts. If you are offered a wad of cash to do something that is only slightly problematic, do it. it’s when someone shows up and asks you to shill for a beef jerky company that also uses tons of preservatives that you should start to feel guilty about it. I make toothpaste, largely because of packaging issues. But I have been known to use Tom’s. I say, if you would use it in your life anyway, go for it. You don’t have to say anything you don’t think is okay. There are some good things about their product, and most people aren’t going to source ingredients and make their own stuff. So this is definitely a better option than what nearly everyone is currently using. Maybe with encouraging support from people like you, they would continue to tweak their product and practices and make it even more in line with how some of us think. We ALL encounter this so much in our lives–supporting ridiculous Whole Foods, driving polluting chunks of metal to volunteer work or a cause we support, I’m sure your university does some unwholesome things…heck, even the BlogHer ad I see over on the side has all sorts of advertisers I imagine you don’t support or wholeheartedly love. We can’t have everything be ideal, but we can constantly refine our path and help others with theirs. And you have to have a little income–there are things that even the most self-sufficient (especially with a family) cannot do without real money. I think it’s great that you’re making such a conscious decision, and I’m sure you would continue to re-evaluate it along the path. And congratulations on being so good at what you do that they want you!! I’ve been thinking more about this, and I have one thing to add. You titled your post “This is probably why I have no money,” and it’s funny – even the way that’s stated implies that the blame is on you for being too staunch, too willfully attached to your principles, but the blame shouldn’t be on you at all in this case. You’re a victim of circumstance, financially and ethically, whether or not you decide to go for it. That’s the cold fact. Yes, you have the small amount of privilege that comes from even being approached in the first place, but that’s still privilege that’s being decided by a system in which you have very little to no power. It’s awful to think of oneself as a victim of the global finance and corporate titans, but that’s the situation for the vast, vast majority of the world. Sayward, I work at TJs but they are hardly a green company. EVERYTHING is packaged in plastic, so much is one time use, so much is grab and go. Think of the carbon foot print of where all there stuff comes from! I’m conflicted too, BUT, it IS a great company. I get paid pretty well for what I do, have great benefits, and I pick and choose what I buy there. It has been a conflict with me forever, but I’m getting a good living out of it. YOU need to take care of yourself, and if that means accepting the job, go for it! Perhaps it’s time to stop living our selfish consumer lifestyles with the reward mentality that has driven our culture to such extreme destruction that it has. I’m not coming down on you Seyward in fact I think you’re courageous for asking. I think you would get spiritual satisfaction from not accepting their offer(and I’m from Maine! Though damn Colgate for taking it outta of the poor state). Anyway I think you would get material satisfaction from accepting their offer do it’s up to you what feeling you want. There are a lot of comments here and I have not read though all of them, so forgive me if someone else has already brought this up: While I totally empathize with your con, I think you should do it. No corporation can change without good people like you fighting the good fight. How will Colgate ever become a more ethical and responsible corporation without good guys willing to partner with them and show them the way? I agree! Plus you said you use the product yourself so I say go for it! I thought you made your own toothpaste! Good lord. You have a child to support and you need to pay your bills. If the fact that Tom’s is owned by Colgate isn’t enough to stop you from using the product, why would it stop you from writing for them? I’m really not trying to be rude, just…. logical. Do what is best for you and do what you can for the world in the meantime. We can’t all be martyrs with no money just because the world is a crazy, complicated, and corrupt place. We can do a lot, but we can’t do everything. Look I don’t expect a response, but I will say this. Don’t be a fool. Do it. When you’re 60 and looking back at why you DIDN’T…you will have regrets, when you could have been socking away money for ….your kids, marriage, your education, emergencies, etc. Life happens. Nothing in life is perfect. You probably know that the film for the camera you use is made with animal products (gelatin, I believe), etc. That’s why I call myself plant based instead of vegan. It took so much stress off me and allowed me to smoothly transition to as-close-to-vegan as I can get. I don’t eat dairy, eggs, meat, fish, poultry, but we are living in this imperfect world, so I don’t stress over the by-products. I am now happy, at peace with myself, and can look a cow in the eye. You will make yourself neurotic if you keep ruminating on why you SHOULDN’T. Take every opportunity you can, like this one, if it doesn’t conflict with major ethical/moral issues. And this one doesn’t. If it does, you will have to re-examine your entire life and go live in the Himalyayas somewhere. Ok. I’m off my soap box. DO IT. Someone you know very well says “if can’t do everything, do not do nothing, do something, anything”. No one is perfect. Keep using it. You are already not far from being wonderwoman, but don’t push it, you are not doomed to hell because you use a colgate product. (I’m a little late to the commenting phase, oops) Tricky situation. I say do it. Not only because it will draw attention to a good vegan product but it would also bring attention to you as a entertainer (of sorts) and a rep of the vegan community. I understand your hesitation with the larger corporation being non-vegan but I feel confident in you and your values of compassion and wellness. Okay, I’m late. Have not had time to read my fave blogs in quite a while. Here is my two cents. Buy the product while it’s still good. Being bought up by a giant corporation is an epidemic, and I feel that big companies buy up good, ethical, high quality companies so that they can change the standards eventually. Eventually they can say, “get real, nobody makes anything like that any more”. There is the recent scandal about reducing the standards of the organic food label. The national director of OCA was arrested for protesting. Big companies get involved because of the little organics companies they have bought. If they can lower the standards and do things more cheaply, there will be more profits. If you buy the product while it still has its integrity, you are supporting what is being done right. Then you can drop it when the quality is degraded, and the reduction of support, yours and others’, will be measured. Mergers are something nearly impossible for small companies to get away from. It’s a predatory thing, which I don’t fully understand and can’t explain right now because here comes my boss.